This post is entitled, Family Duplo Blocks, but thanks to an awesome reader who contacted me, I was corrected that the blocks we used are not LEGO Duplo blocks- they are Mega Bloks! The great news? Either blocks could be used here 🙂 Enjoy! Amazon links are provided for you – thank you for your support! Looking for a great way to include family members in your child’s play? 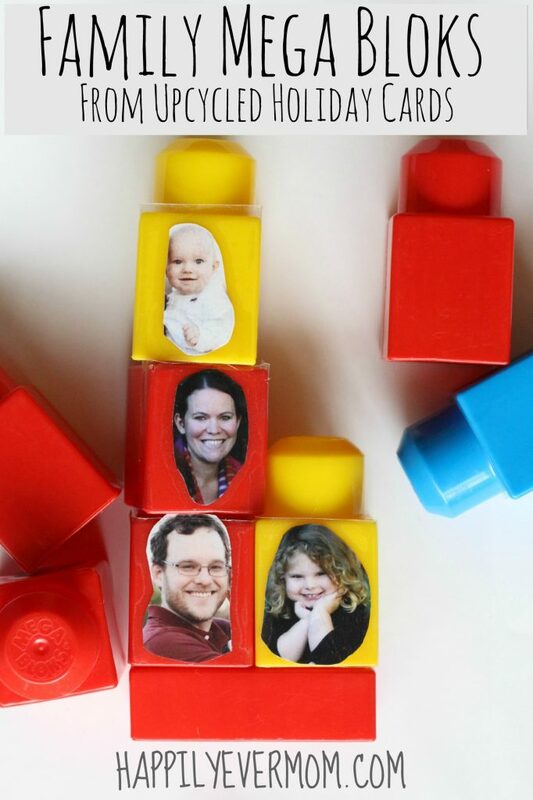 These family blocks are the perfect way to connect young children with their love of blocks and their love of family. 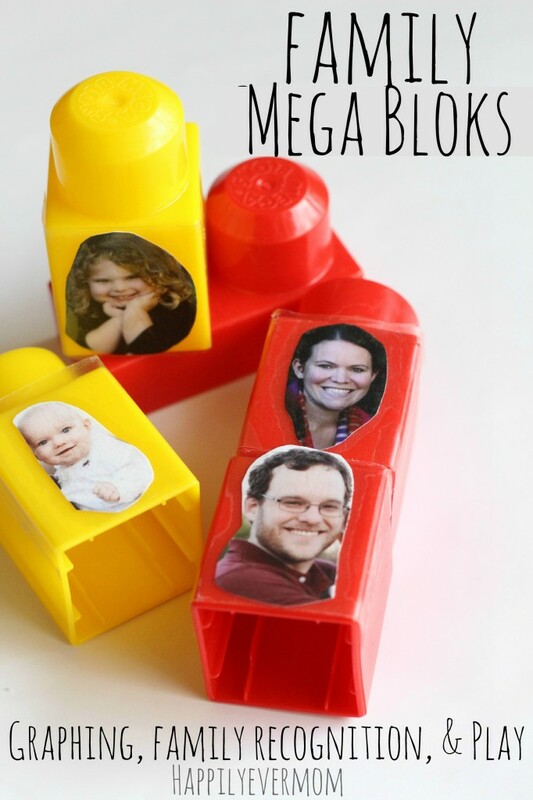 You’ll only need a few things around the house to make these family Mega Bloks – oh, and remember those holiday cards you got in the mail? We used the photos from our holiday cards to make these blocks! We went through our holiday cards and cut out each member in our family. The great thing about contact paper is that it has a grid on the back. This allowed me to cut a 2×3 rectangle that fit perfectly onto the face of the Mega bloks. **Tip: Be sure to cut the contact paper so that it is flush on the top and bottom of the block, but make sure there is a little extra contact paper to wrap around the block so the photo won’t fall off! Offer these Family Blocks alongside the standard Mega Bloks. 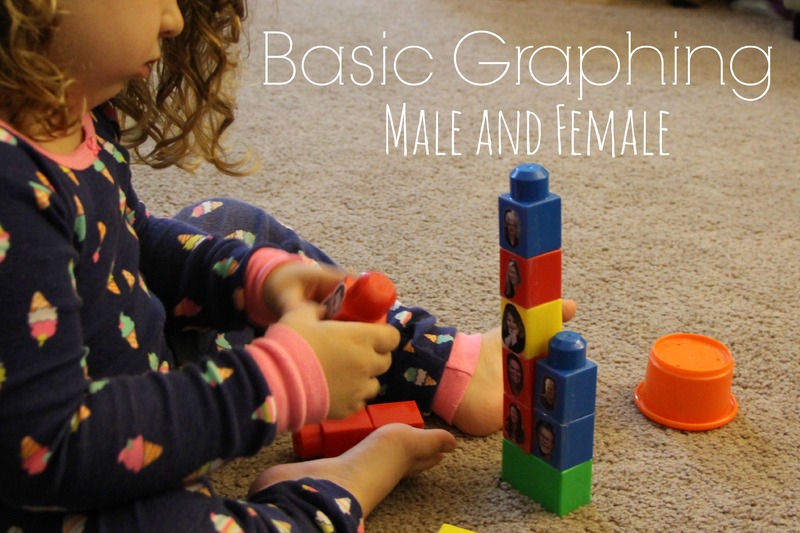 Extend the play by graphing family members into categories like: male/female, Uncles/Aunts/Cousins/Grandparents, immediate/extended family, etc. **Tip: The long blocks are a great base for graphing! Learning family titles: Aunts, Uncles, Cousins, etc. These blocks are a beloved addition to our play. We not only get to spend time together building, but we get to recall the wonderful memories and time that we shared with our family over the holidays. What a perfect start to our New Year! Do you still have your holiday cards on hand? What have you used them for? Be sure to stay in touch on Facebook & Pinterest! What a cool idea! Family faces are so engaging, I am not surprised it is already a beloved toy! Thanks, Laura! The faces have taken block play to a whole new level around here! Hi there! This is a wonderful idea…my little guy loves photos and blocks 🙂 I can’t wait to try it! Thanks so much, Ashely – I hope your little guy enjoys these as much as we do! Thanks so much, Claire! We love them, too!! What a great idea! Cute, creative and fun!